Choosing Time – Now what do I do? Valuing students and their choices shows trust and respect while using every minute of your day in an authentic and real way. Students are finished and you have nothing organised for the early finishers. Here’s an idea that takes five minutes to prepare and a school year to use. Make a poster with the following message. Available for everyone who has completed their work. Choose something to do that is educational and worthwhile. We must both be pleased with your decision. When you have decided come and tell me. Choosing Time – make a poster today or download this one. When students have finished the set task and you have no other activities or plans direct them to the Choosing Time Poster which provides an opportunity to do some thinking and have a plan of action. (Idea: Instead of directing them to the poster ask them, ‘What are you doing now or what’s next?’ Once students know the routine of Choosing Time they will tell you what’s next? I am going to play chess. I am going on the computer. What are you going to do? (Puts students in the position of making an educational and worthwhile decision knowing full well you may not be happy with the answer,’ to play games’. I am going to find out about dolphins. Well I expect at least 3 new pieces of learning, Ok? Always insist on some ‘new learning’. No point in students just trawling through information, making a power point a poster, an information document about things they already know! Ok, I am happy with your decision, have fun. Don’t waste a second or let students waste a second. You only have approximately 5 hours face to face time each day with your students, less on some days if they have specialists. ‘The sky is the limit’ when students are given the opportunity to think of an activity that is ‘educational and worthwhile’. Remember you have the final say. If you don’t like their choice say, ‘I am not happy with that decision, make another plan and come and tell me what it is!’ You will find that the choices they make are always worthwhile. They ‘get’ the idea of ‘educational and worthwhile’. Choosing Time is a privilege and is not to be abused. It allows the students to know that you are putting your trust in them to make a worthwhile decision and not to let themselves or you down. Note the Learning and Life Tip – Be good to yourself. 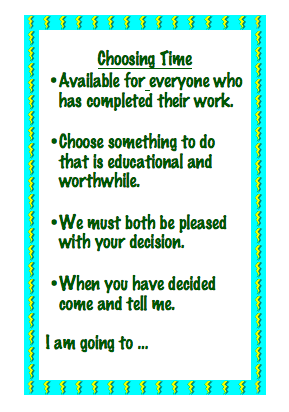 Let your students make and display the Choosing Time poster. Perhaps put it on green paper, green representing one of Edward De Bono’s 6 Thinking hats – the green hat for new thinking. An e.g. of a conversation with a Year 2 student. Great, What are you going to draw? Wait here and when you have a plan tell me. I am going to draw a tiger. Which part will you concentrate on and what will you use as a reference so you know it is right. By asking a question students understand that value is placed on Choosing Time and new learning takes place. I learnt how to draw a tiger’s ear properly and did you know that tigers have a white spot behind their ear. I learnt that Keith is a very good chess player. I learnt that if I don’t concentrate on my work and get it finished I miss out on ChoosingTime! You will be amazed at the things students will tell you they have learnt – Creating a learning culture every day in every way! Listening to the students justifying their choices as ‘educational and worthwhile’ is a highlight. They know it has to be something worthwhile, not chatting away in the corner, aimlessly trawling on Google, or wasting paper on idle drawings that may end up in the bin! When you show you value every minute of time you spend with your students they will value the time they spend at school.